We are drawn to foods that are the colors of the rainbow. 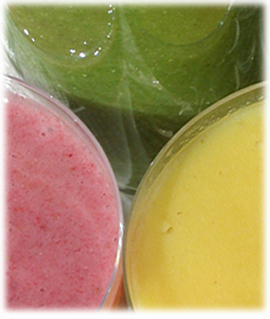 Smoothies, infused with fruits or greens, a little almond milk or fresh pure water, simply burst with flavors and tastes. Their colors—emerald, rosy pink, golden yellow—are like rays of prismatic light, and bring the colors of sunlight into our lives, any time, any day. First the eyes feast during preparation, then the body and spirit! 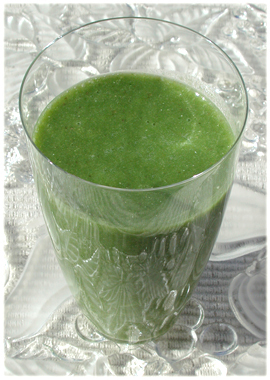 Greens are an integral part of green smoothies. The greens help to balance the sweetness from the fruits, and build strength with minerals and amino acids—the building blocks of protein. Victoria Boutenko, author of Green for Life, writes: "Blended green smoothies are a simple and delicious way of accessing the healing properties of greens. Whether you eat a raw food, vegan, vegetarian, or mainstream American diet, regularly drinking green smoothies can significantly improve your health. This miraculous drink is available to every person in every country." Chia and hemp seeds add healthful Omega-3 EFA's, and protein. We recommend using milder greens and in smaller amounts if you aren't yet a lover of greens, until your tastebuds become used to the unique flavors. Stronger flavored greens, such as kale and collards, can take a little getting used to. Bananas are close to miraculous in how they can make the green taste almost disappear. However, one thing to be expected is the zing of energy that comes from sipping on something green! 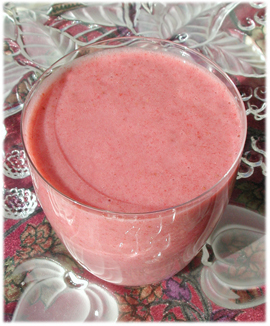 Blended smoothies are so easy to digest, they are usually perfect for everyone, young and old. This is a workhorse recipe for us. Victoria says that greens are actually a unique food group, and unlike vegetables, help to digest every type of food through stimulating the secretion of digestive enzymes. We never would have thought that greens could taste this good with fruits! Put water into blender. Add spinach, and pineapple, and blend until smooth. Add bananas, chia seeds, hemp seed nuts, and blend until velvety. If overly thick, add a little more water. The lovely pink color will surely brighten your day! The taste is refreshing, and cooling. Rinse strawberries under cool water. Remove green tops, or bad spots. Add strawberries and bananas to blender. Add water, or your favorite milk. Blend until smooth and velvety. If you don't have strawberries, try any of the following: raspberries, blackberries, cherries, or blueberries. You can make a thick nut milk by pulverizing nuts in blender, adding a little water, and blending until smooth. Or try using yoghurt or kefir for a substantial smoothie. 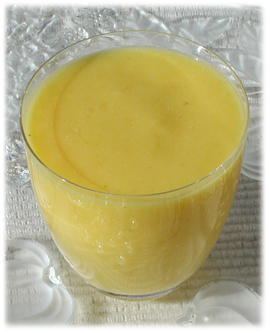 This smoothie looks like a beam of sunlight materialized in your glass! Put fruit into blender. Add water. Blend until velvety smooth. There are colors within us... colors around us. We emit light—the human aura—luminous and beautiful. Fresh foods, like smoothies, fill the body with an array of colors and vibrations. Think of the soft blush of a rose, the pink of a baby's skin, the yellows that mirror a sunrise, or the stunning greens of spring, all of which evoke emotions and images. Green is also the color of the heart center. Meditation, contemplation, singing holy words, visualizing colors flowing freely through the body, and eating foods with pure hues can bring life, love, and light into our being. These practices are healing, uplifting, and are filled with joy: delight to the heart in knowing we are doing something good for ourselves, and pleasure for the body in eating foods that are so utterly delicious! Experiment, have fun, and the colors will come! "Chlorophyll is as important as sunlight! No life is possible without sunshine and no life is possible without chlorophyll. Chlorophyll is liquefied sun energy. Consuming as much chlorophyll as possible is exactly like bathing our inner organs in sunlight."